My good friend, Dr. David Silver, has a 93-year-old uncle who likes things his way. He could no longer see the numbers on his scale, so he insisted on purchasing a talking scale, even though his wife offered to help him out by reading his weight. This Baked Apple Sweet Potato Side Dish will keep Sam and everyone else happy with the numbers they see on their scales. Now if only I could figure out a way to send you all the aroma wafting from the oven as this cooks to perfection. Preheat oven to 400F. 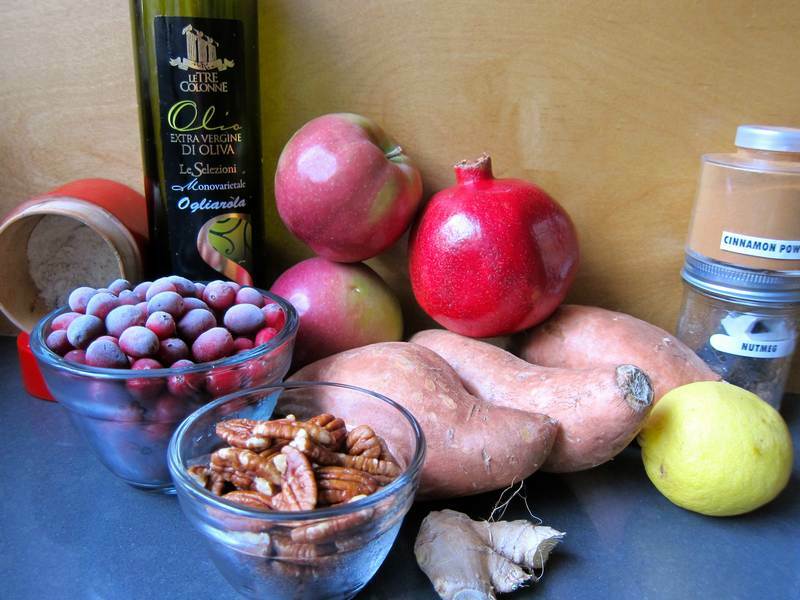 Combine ingredients except for pecans and pomegranate in a large bowl. Lightly grease a large 9×13-inch baking dish. Place the sweet potato mixture into the pan. Bake for 45 minutes. Then, if you can resist, allow it to rest in the hot oven for 30 minutes. 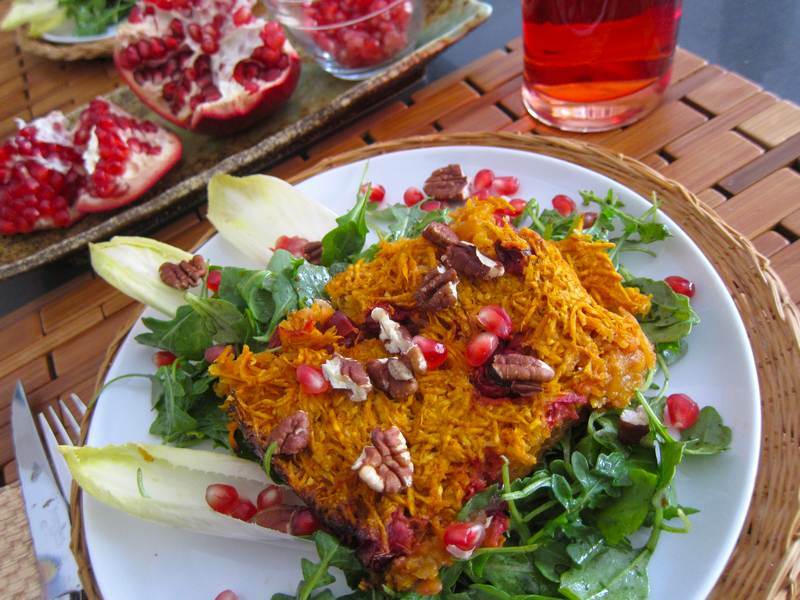 Sprinkle the pecans and pomegranate seeds on top before serving. Can be served on top of baby arugula salad, lightly dressed with olive oil, balsamic vinegar, sea salt and black pepper. Serves 6-8. May your life be filled with things to be grateful for, especially good health and a loving entourage. « Coconut Cacao Bark – NEED Chocolate? Ummm, that was my thanksgiving recipe! Got any great ones for me? True, but many JC readers are…and we can be early for next years Thanksgiving! Great story and this dish looks like a wonderful Thanksgiving side dish. Thanks Jovina! I love good stories and good recipes. Yum yum will have to try this….is it crispy by the way? Ok so the real reason I say to let it sit in the hot oven for an extra 30 minutes is cause I was at yoga class and I had the oven on timer and when I got home the kugel was all shrunk down and the very top and edges were a little crispy. I imagine that if you wanted it more crispy you could brush a little olive oil on top. Will try that next time. Not sure why the photos didn’t really do this dish justice. I may redo the photos too. Tasted great left over – even cold – good for workday lunch. Only a little crispy. Inside is creamy. Flavour is perfect!